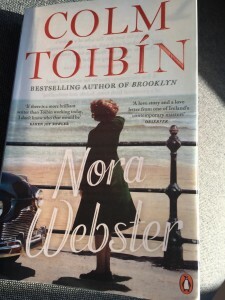 Colm Tóibín’s Nora Webster was published in the autumn of 2014. I’ve recently finished reading the Penguin paperback edition. It’s superb. People love talking about writers as storytellers, but I hate being called that. Nora Webster has little plot or ‘story’ to speak of. It shows in chronological sequence how Nora, whose husband Maurice, a schoolteacher, has recently died, struggles to deal with the commiserations of well-meaning family and neighbours as she tries to support her two grieving sons, who still live with her, and her older daughters who have left home. It is set in the late 60s in the sleepy southeastern Irish town of Enniscorthy (Tóibín’s own birthplace). Like women the world over she has to sublimate her own pain and grief while nurturing her emotionally wounded, damaged but needy children. What comes less naturally is learning how to live her life alone; she had previously lived a largely vicarious existence – the needs, tastes and opinions of her husband, and to a lesser extent, her family, had supplanted her own. She must learn how to live bereft of the husband she loved deeply; this means learning a new kind of freedom, and to accept the unwillingly acquired solitude and painful independence that comes with it. The novel shows with deft sympathy how she undergoes a series of epiphanies to achieve this state. She has to exorcise the ghost of Maurice before she can find out who she is. As such I see a thematic influence not so much from James Joyce (whose early style is clearly discernible in Nora Webster) and other Irish writers, whom early reviewers tended to adduce, as from Ibsen’s Nora of A Doll’s House. I shall focus here on this aspect of the novel, and on Tóibín’s beautifully lucid, restrained prose style. He was speaking as though he had some authority over her…she knew that she must have appeared put down, defeated. For a moment, Nora felt impatient with her. She was starting her life, she could live where she liked, do what she liked. She did not have to get the train back to the town where everybody knew about her and all the years ahead were mapped out for her. Nora plainly feels envious of Fiona’s comparative freedom to choose, and frustrated with her own circumscribed, provincial life, with the responsibilities and constraints that convention and motherhood imposed. she wondered if there might be something interesting on the television. She went over and turned it on and waited for the picture to appear. How would she fill these hours? Just then she would have given anything to be back on the train, back walking the streets of Dublin…[she turned off the TV, ‘irritated’ by the canned laughter on a comedy show] The house was silent now. [She opened the book she bought earlier then put it down.] She closed her eyes. In future, she hoped, fewer people would call. In future, once the boys went to bed, she might have the house to herself more often. She would learn how to spend these hours. In the peace of these winter evenings, she would work out how she was going to live. Tóibín is able, in such apparently banal scenes, in that deceptively unadorned prose, to show us a woman’s complex, treasured inner life in the process of growing and changing in response to the the life endured in the external, intrusive world. Here I’m reminded of Eveline’s existential dilemma (in Joyce’s story of that name, about which I wrote on the Mookse and Gripes site HERE), sitting in her dusty, dusk-filled room, longing to escape from the cage of domestic duty, with a brutal father and humiliating, mind-numbingly tedious shop job, and wondering if her lover is her liberator or potential oppressor. Both narratives show a woman attracted to solitude but feeling a paradoxical impulse towards human warmth and companionship – and love. …Nora viewed the office in Gibney’s as a place where they had spent years working merely because the right chances did not come to match their intelligence, an intelligence that, as married women, they had cultivated with care. She thought of the freedom that marriage to Maurice had given her, the freedom once the children were in school, or a young child was sleeping, to walk into this room at any time of the day and take down a book and read; the freedom to go into the front room at any time and look out of the window at the street…letting her mind be idle…but as part of a life of ease that included duty. The day belonged to her, even if others could call on her, take up her time, distract her. Never once, in the twenty-one years she had run this household, had she felt a moment of boredom or frustration. Now her day was to be taken from her…Returning to work in that office belonged to a memory of being caged…Her years of freedom had come to an end; it was as simple as that. Sure enough, when she starts work all the tedium and petty tyrannies reappear, and she longs for ‘the feeling of pure freedom’ when she is able to leave the office and go home. Like Ibsen’s Nora, she has to learn what her opinions are. The narrative is set against the early days of the Troubles in Northern Ireland; Maurice had been a staunch supporter of Fianna Fáil, and she had deferred to his political views. Now she realises she can think for herself, assert herself independently. At first this personal exposure is unnerving, but she slowly comes into her own. This growth is portrayed with immense skill and is the most rewarding, heart-warming aspect of the novel. In all this noise and confusion, she felt a sharp longing now to be anywhere but here. Even though she often dreaded the night falling when she was in her own house, at least she was alone and could control what she did. The silence and the solitude were a strange relief; she wondered if things were getting better at home without her noticing. Since she was a girl, she had never been alone in a crowd like this. Maurice would always decide when to leave or how long to stay, but they would have a way of consulting each other. …she was often irritated by the way in which Maurice’s mood could change, how anxious he would be to go home one minute, and then how eager he could become, how easily involved with company the next minute, while she waited patiently for the night to be over. I don’t recall reading another novel with such a moving, engaging account of one person’s experience of the transforming power of deep emotional trauma. It’s a novel that reaffirmed my faith in the ability of a great novelist to enhance one’s own life through the process of reading their work. Colm Tóibín is an apt pupil of that other literary master of his: Henry James. They both have that empathetic insight into the character of ‘an engaging woman’ that takes one’s breath away. Another writer who comes to mind in this regard is Evan S. Connell, whose novels about Mr and Mrs Bridge I reviewed here, here and here – with a nod towards the influence of Mme Bovary. Other reviews deal with aspects of the novel I’ve not touched on here: the nuanced depiction of Nora’s two boys and the two older girls, for example, who play their part in Nora’s tentative emancipation. Max’s customary perception is well to the fore in his recent piece on this novel here at Pechorin’s Journal: he’s particularly good on the family drama: Nora’s relationship with her children and with the ‘love of her life’, Maurice; also on the visceral depiction of Nora’s grief and depression, and the links with the novel’s prequel, Brooklyn, with which it shares a number of themes, and compared with which Max finds Nora Webster less impressive. I find them both outstanding. Even when brilliant, rich, powerful women have worn magnificent black in the past, they have usually needed the pretext of mourning to do so. And what has seemed to me a curious point of interest for study is the way which, through time, the use of this colour – the colour that is without colour, without light, the colour of grief, of loss, of humility, of guilt, of shame – has been adopted in its use by men not as the colour of what they lack or have lost, but precisely as the signature of what they have: of standing, goods, mastery…It relates to the relations between people in society, and to the relations between men and women; and to the way in which people display externally what in some ways is a ‘dark’ interior of human motivation. This is John Harvey in his introduction to the first of these two fascinating studies of the colour black. In Men in Black he goes on to examine how and why black became the default colour of dress for men, associated with the world of work and professional dignity, contrasting with women who tended to wear white (or various other hues from the colour spectrum) – often in ‘vicarious display by men’; most jobs were ‘closed to women’. The period of black dominance in clothing for men dates largely from the early nineteenth century until shortly after the First World War. But both black and white are colours of denial; and what they deny is colour. Thereafter it became the colour of Chanel’s little dress. In the 1930s it represented for the fascists the ‘most complete and intense way of marking off a group of people from the polychrome ordinary mass’. Himmler, the head of Hitler’s terrifying SS, admired ‘the disciplinary principles on which the Jesuits were organized, and was called by Hitler his Ignatius Loyola.’ More recently it has become the colour of rebellion and youth, from bikers and beatniks to punks, goths and emos. These are scholarly but lavishly illustrated works and furnished with copious academic notes, but as that opening extract I hope shows, the texts are written in highly engaging prose, with carefully modulated, elegant sentence structure and, despite the formidable erudition, an accessible style and enthusiastic tone that encourage the reader to devour the text greedily. Both books are packed with well-researched detail. 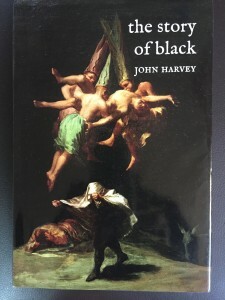 As Dr Harvey is a literary scholar there is not surprisingly an emphasis on the literary aspects of the significance of the colour black: there are long sections on Victorian literature in particular, with perceptive accounts of Dickens’ dark cities and their inhabitants, and, for example, the saturnine characters in Charlotte Bronte and George Eliot. Ruskin is keen but cold like the water, and indeed was himself so damaged by strains of the most intimate British asceticism that he was unable to be a husband to his wife…There are elements of personal pathology in Ruskin’s obsession with the plague-cloud, as possibly there are in Dickens’s darkness: but their pathologies were of their culture, involving as it were ethical injury, and sensitized them to a greater pathology. Elegantly and eloquently expressed. I particularly like that phrase ‘ethical injury’: it sums up succinctly the personality of the enigmatic Ruskin. I was surprised to discover in Men in Black that dandies like Beau Brummel tended to favour tight-fitting, well-cut black clothes rather than peacock displays, at least at night. What I found so interesting about these two books is that they take a topic as mundane as the colour black – one which I for one had never really paid much heed to; it’s rather like what’s been said about Jane Austen’s novels: she doesn’t mention the domestic arrangements of the country houses in her fiction because the maids are taken for granted, invisible. That’s how I was with the colour black. These books have enlightened and enthused me. In Men in Black we learn that dandyism ‘played with discipline, and self-discipline, and the style was, not surprisingly, popular with the military’ – Brummel had been a captain in the Hussars (what a splendid name), and Wellington was thought a dandy. Wellington in turn had to reprimand the officers of the Grenadier Guards for riding into battle, on a day of foul weather, with their umbrellas raised. A perfection of self-denial may make one holy, a person to be heeded with reverence and awe: and black, as the colour of power over oneself, has come to be associated with impressive, intense inwardness. Then black is associated with the melancholy lover, and with melancholy in general – the ‘black bile’ of the ancient lore of the bodily ‘humours’; Hamlet is a key figure here (‘a man whose black clothes, finally, are the dress of his dark ontology’) and Robert Burton’s encyclopedic Anatomy of Melancholy, first published in 1621. But black is a paradoxical colour, ostentatious through the show it makes of renouncing ostentation. The man in black can sidestep the social staircase because he seems to take his stand on a moral stair instead, and indeed to take the high ground precisely through humility. Other areas explored by Harvey include black as a skin colour, and social/literary attitudes to ‘négritude’ – in Othello, for example. Devils (and the devil), of course, were also frequently depicted as black. 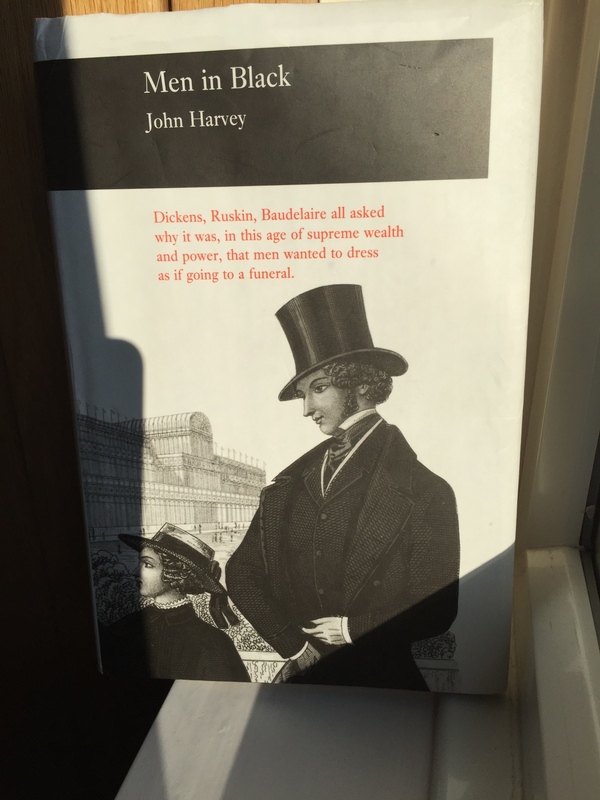 The extracts I have quoted are an indication of the elegant lucidity of Harvey’s writing, as well as of his capacity for conveying a great deal of information in a manner that is as rewarding as a well-written, pacy novel. is associated at once with intensity and with effacement: with importance, and with the putting on of impersonality. Alone or in ranks, the man in black is the agent of a serious power; and of a power claimed over women and the feminine. Black may be a shadow fallen on the feminine part of man. I’ll conclude by stating that The Story of Black covers much of the same ground as the earlier book, but with very little repetition and a host of different material, and a closing section that looks at some developments in the world of art in the last few years. Both books belong to a series produced by Reaktion that use copious illustrations as the basis for historical analysis. I’d recommend these texts to anyone with even a passing interest in literary, artistic/cultural, social, political or philosophical history.